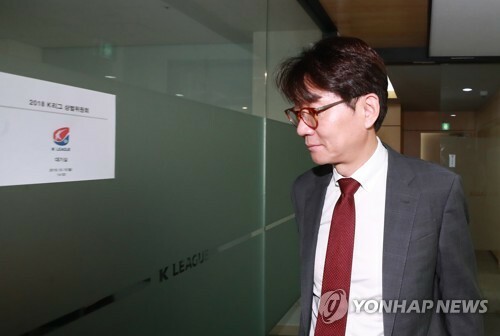 SEOUL, Oct. 15 (Yonhap) — South Korea’s pro football league on Monday slapped a two-year ban on the CEO of Gangwon FC for financial misconduct and other wrongdoings. The K League disciplinary committee handed a two-year suspension in football-related activities on Cho Tae-ryong and imposed a 50 million won (US$44,240) fine on Gangwon. The K League said Cho abused his position and tried to run the club for his personal gain. He also damaged the sport’s political neutrality and tarnished the league’s honor, the league office said. According to the K League, Cho misappropriated the club’s advertisement funds after doing business with a marketing agency named M+H, the company that Cho serves as president of. He also received 500 million won worth of incentives from the club after abusing his voting rights at board meetings. The K League said Cho collected data on Gangwon residents’ political leanings. The K League added Cho’s misconducts are also in violation of FIFA codes. Gangwon said they will not accept the K League’s decision and may take the case to the court. Cho joined Gangwon in 2016 after working as general manager of South Korean baseball club Nexen Heroes for eight years.